Malcolm Arnold: Sarabande from "Solitaire"
This is a motley collection of pieces, most of them recorded by obscure orchestras and conductors but which much to enjoy nonetheless. AS&V has worked wonders on the recordings which come up sounding fresh and clean as a whistle notwithstanding some of them being over forty years old. The old favourites such as Docker, Tomlinson, Vinter and Arnold are here with the latter's "Sarabande" from the "Solitaire" the only really popular piece. The unfamiliar names churn out good music too, this is vividly demonstrated in Peter Hope's, "Ring of Kerry" and Irish Legend (full of haunting traditional Irish melodies), Wilfred Joseph's "Aelian Dances" and a smashing suite by Bryan Kelly, "Comedy Film". 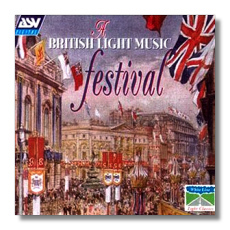 It would be too tedious to list each individual work and piece here but will almost eighty minutes on each disc at mid price, this is a truly ideal collection for lovers of this intrinsically "British" style of music.